We pride ourselves in offering reliable and dependable products from well-known brands to fulfill all your office printing needs. We have a large variety of HP printers that ensures that we can help you find the right model for your specific needs whether you’re running a small or large business. The right equipment allows your operation to remain productive and efficient. HP introduced advanced technology JetIntelligence to their LaserJet printers, which means you’re printing faster, efficiently, and in a secure environment to protect sensitive and vulnerable information from exploitation. Another perk of the technology is that it supports wireless direct printing to allow you and your employees to print from any location, not just when you’re physically present in the office. If you’re looking to use your printer strictly for printing, the LaserJet Pro series is an ideal option. It prints up to 35 pages per minute, which is plenty for a small and low print volume workplace. Users can connect directly with a wired connection or use a wireless device such as a phone, tablet, or laptop to print documents and other materials. If 35 pages per minute seems like it’s not fast enough, you can upgrade to the LaserJet Pro MFP series for a little bit more. 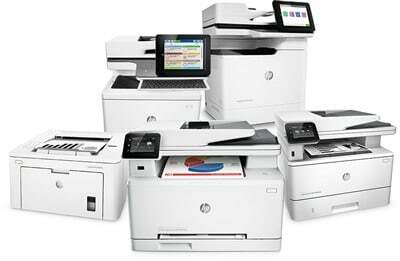 This line of HP products expands beyond basic printing and also allows you to copy, scan, and fax. Having all these functions in one machine is not only convenient but very cost effective for your business. It also prints up to 42 pages per minute for a slight bump up from the basic LaserJet model’s 35 ppm capabilities. We aren’t one of those companies who sell you a product and send you on your way to deal with problems or complications on your own down the line. We focus on HP printer repair Atlanta and work with you to assist with finding the right product and continue by not only telling you all the features that your printer includes, but show you how to use them as well. We can help set your equipment up and if you have any problems, simply make a phone call, and we can be there to help. Running out of toner when you need to print something is incredibly inconvenient. It usually happens at the worst time and can derail your current project. We’ll also dispose of old cartridges to save you the hassle. Contact us at 800-537-0669 or solutions@reach-technologies.com all your HP printer sales needs.